People with diabetes often suffer from numbness and pain in their feet. Diabetes specialists cannot explain how that happens. The reason is an accumulation of toxins—sticky sugars, rancid fats, mangled proteins, and others—on nerve cells and fibers. Such toxins accumulate because not enough oxygen and “oxy-detergents” are available to remove them. Why are doctors not interested in these crucial issues? The answer: science is dumbed down and doctors cannot distinguish between New Age fog and serious scientific argument. People receiving chemotherapy for cancer often suffer from pain and tingling in their feet and hands. The oncology literature attributes the symptoms to drug toxicity but does not explain how that happens. The reason is an accumulation in neurons and nerve fibers of toxic chemicals—not only the chemo drugs themselves but also by toxins produced in tissues injured by drugs. Such toxins accumulate because not enough oxygen and “oxy-detergents” are available to remove them. Why are oncologists not interested in safe and effective oxygen therapies to prevent or treat neuropathy. The answer: science is dumbed down and doctors only know symptom suppression with drugs. Neuropathy, nondrug treatment Majid Ali MD from Majid Ali on Vimeo. Many individuals develop pain, burning, and “pins-and-needles” on their chest, abdomen, or back after an attack of shingles (Herpes zoster). Neurologists prescribe Neurontin to relieve pain but do not explain why some people develop zoster neuropathy while others do not. The reason is an accumulation in neurons and nerve fibers of toxins—pre-existing load, as well as those produced by viral injury to tissues. Such toxins accumulate because not enough oxygen and “oxy-detergents” are available to remove them. Why don’t neurologists use oxygen therapies to control viral replication and to prevent neuropathy. The answer: science is dumbed down and doctors know only symptom suppression with drugs. Of course, the dog-and-pony shows of the gurus of the anti-aging industry—I have never seen any such guru “un-age” himself—fan the disdain of drug-docs for non-drug measures. The above comments are equally applicable to neuropathy caused by other infections (Herpes simplex, leprosy, Guillain-Barre syndrome), trauma (carpal tunnel syndrome, RSD [reflex sympathetic dystrophy] and others), metabolic diseases (hypothyroidism, porphyria, Gaucher’s disease), degenerative disorders (amyloidosis), radiation, autoimmune diseases (multiple sclerosis), cancer, and alcoholism. Why are the issues of oxygen, acidity, and toxicity ignored by doctors? because American medicine has been dumbed down. Most doctors are likely to be surprised by the question. Oxygen is not only a neurotransmitter, it is the most important neurotransmitter. In cellular energetics, what might be another important neurotransmitter? The answer: ATP. Many eyes are likely to roll on this answer as well. I have never heard a neurologist talk about ATP in his discussion of neurotransmitters. This may be so because their patients are immune to toxic effects of mold toxins, mercury, and pollutants that rupture oxygen-driven reactions that produce ATP. I refer readers to my article entitled “The Grease and Detergent Model of Disease” on this site for a discussion of this crucial subject. For citations and detailed information on the biology of oxygen, I refer professional readers to Darwin, Oxygen Homeostasis, and Oxystatic Therapies (2009), the tenth, volume of my textbook entitled The Principles and Practice of Integrative Medicine. ATP is the primary energy currency of the body. It is also a potent neurotransmitter. It is generated by oxygen. How could evolution have driven the development of the brain and the nervous system without involving its primary energy currency (ATP) in it? Why are neurologists not interested in oxygen and ATP? Because science is dumbed down and doctors cannot distinguish between drug propaganda and serious scientific argument. Oxygen Model of Diabetes Majid Ali MD from Majid Ali on Vimeo. My colleagues and I recognize the value of oxygen and oxystatic therapies in preventing and controlling neuropathy. We regularly observe the clinical benefits of the detergents roles of oxygen and oxy-detergents in most patients we see with symptoms of neuropathy. The damage to nerve cells and fibers caused not by some mythic demons, but by the lack of functional oxygen and oxy-detergents. It is that simple. These safe, simple, inexpensive, and effective therapies are not used in the United States because—well, you guessed it—science in American medicine has been dumbed down. Insulin Toxicity Case 5 Severe neuropathy Majid Ali MD from Majid Ali on Vimeo. Will Dr. Ali’s Breakfast Control My Neuropathy Majid Ali MD from Majid Ali on Vimeo. Will Dr. Ali’s Breakfast Control My Neuropathy Part Two Majid Ali MD from Majid Ali on Vimeo. In late 1950s, I learned a long list of causes of neuropathy, some of them listed above. I was taught that neuropathy causes pain, numbness, tingling, burning sensation, freezing, and “pins-and-needles.” Other descriptions of symptoms were more interesting and included: sensation of wearing an invisible “glove” or “sock”, electric-like shocks, loss of balance and coordination, and muscle wasting. I noticed that while my professors were fluent in regurgitating that list, they rarely identified specific factors that caused the nerve damage. I understood that my job was to regurgitate that list when asked to do so, but not ask how that might happen in a given individual. They were not interested in what their patients ate, inhaled, or absorbed through skin—nor what oxygen-blocking toxins and fermenting microbes in their guts might have produced. They never focused on foods and environment. One does not like to have one’s ignorance exposed. My professors were not exceptions to this rule. There was no reason for me to ask annoying questions. That did not change during my surgical training in England in the 1960s. Surgery is not about thinking. It is about doing. Indeed, too much thinking is bad for surgery. Patients often equate thinking with doubt. 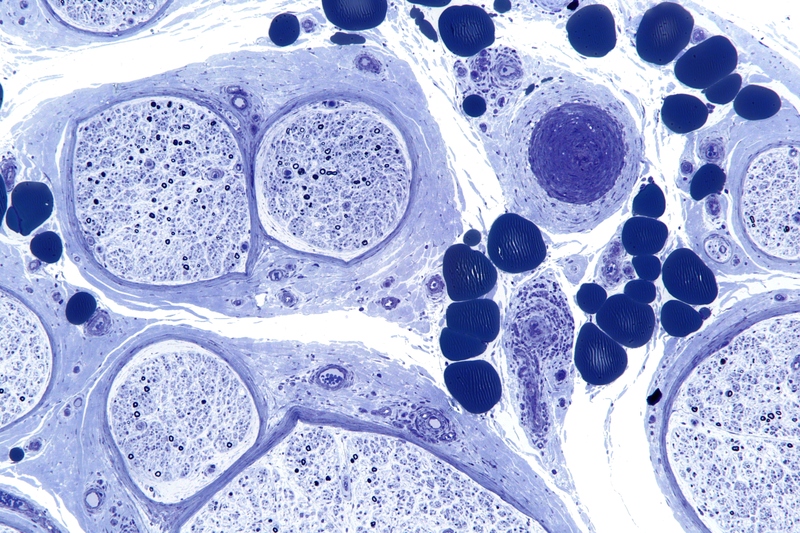 As a hospital pathologist, I examined a large number of nerve biopsies but never identified the cause of the nerve fiber or nerve cell damage observed under the microscope. There are no known methods for detecting mold toxins and environmental toxins in the biopsies that do not include nerve cells. I never met a neurologist who was interested in toxicities of foods, environment, and thought. I learned that I should not ask them about what toxins might have damaged the nerves which I examined in formaldehyde-fixed tissues. As for oncologists, they considered chemo-induced neuropathy an “acceptable” risk of their drugs. They seemed uninterested in finding nutrient and detox therapies that could prevent nerve damage. In the 1980s, my theoretical ideas of neuropathy changed rapidly when I cared for people with fibromyalgia, mold toxicity, environmental toxicities, and nutritional deficits. They suffered from numbness, tingling, burning sensation, cold hands, and pins-and-needles with high frequency. Yet, they had not been diagnosed with any forms of neuropathy I learned in school. What our patients did have were fermenting guts and polluted livers.